Eataly just opened in New York to a ton of PR and local excitement. It is a massive indoor space filled with restaurants and a large, mostly Italian dry goods and gourmet items plus local produce, seafood and a local meat counter. A foodie's dream come true. One very interesting feature is a station dedicated to chopping and preparing vegetables to your specifications. Initially I thought "who would ever be so lazy that they couldn't chop their own vegetables?" But then, I realized that there are some vegetables that are so onerous to prepare that I actually avoid buying them: artichokes! Would they pare raw artichokes down the the hearts and shave them on a mandoline so I could make a fresh artichoke salad? I optimistically picked out and weighed a dozen baby artichokes and presented them to the counter. Sure enough, a short while later I had shaved raw artichokes floating in acidulated water, ready for assembly at home. 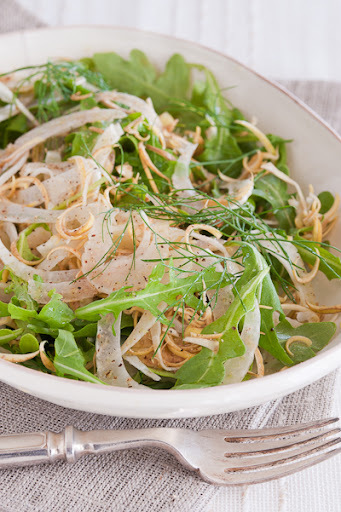 At home, I sliced fennel thinly on a mandoline, tossed the fennel and the artichokes with some baby arugula and fennel fronds and drizzled it with some nice olive oil and red wine vinegar. An "instant" salad that would have taken me quite some time without the leg up. I was so excited I forgot to shave the 12-year aged Parmesan I had bought to go on top. I can only imagine the other things I can concoct with freshly prepared artichokes! I'm quite sure they didn't see this coming but they were game and I'll be going back. LOL... what an idea! I don't buy artichokes for the same reasons and I have yet to check out Eataly. Now, I have one more reason to go there soon!!! This is one of my favorite salads! It's great to know that there's a way to have it at home-- and terrific that Eataly thought to protect it in the acidulated water. I also love shaved artichokes lightly sauteed with olive oil, shavings of Parmesan, and pistachios.